On this excursion you will get to the west and east extremes as well as to the very top of Acapulco. You will also be explained about the lifestyle of the Mexicans as you drive to very interesting sites as your knowledgeable and fun loving tour guide tells you everything about this fabulous city. Your knowledgeable and friendly tour guide will pick you up at the lobby of your hotel, Do not forget to call the local supplier to define exact time an pickup place. Once on board the excursion will head to The Vallarino Turtle Camp where, after a short but very complete explanation of their mission in the camp, you will proceed to help release every one of the turtles into the ocean. Then the tour will head to Las Brisas residential area, the most exclusive neighborhood in town where you will pay a visit of 30 minutes, always in company of your guide, to the Chapel of Peace and Trouyet Cross, the highest part of observation to the bay. 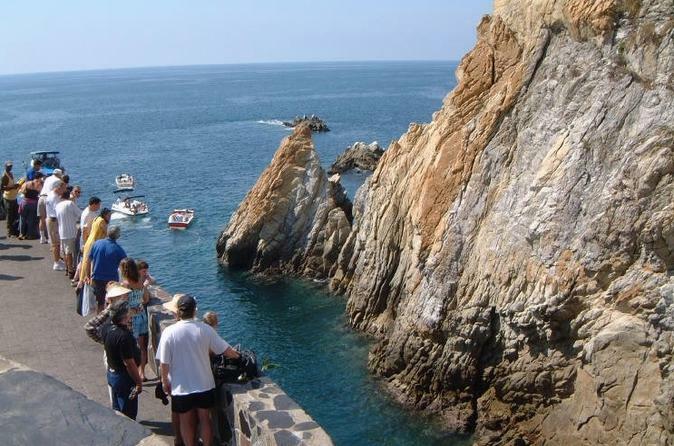 Lastly you will see La Quebrada, Acapulco's High Cliff Divers. The tour will also includes a short stop for shopping where you will enjoy margaritas, piña coladas, beers or sodas. You will then be dropped off at your hotel.